What sort of non-surgical weight loss procedures are available? Over the last few years, the internet has become inundated with therapists and clinics, offering various forms of non-surgical weight loss treatment. For people who would rather avoid going under the knife, non-surgical weight loss and finding a safe, non-invasive weight loss procedure is particularly appealing. But the key is, it has to work! The Endoscopic Sleeve Gastroplasty (ESG), also known as the “accordian procedure”, was pioneered by the Mayo Clinic in 2012. Surprisingly, this is regarded as one of these so-called non-surgical weight loss procedures, because it involves inserting a tube down the patient’s throat, rather than cutting through the abdomen. However, the surgeon then goes on to sew pleats into the person’s stomach, reducing the capacity of the organ and making it look like an accordian! We would question, however, how this particular method could count as a non-surgical weight loss procedure; to us, it appears invasive. Another innovative, non-surgical weight loss treatment is 3D liposuction. The“3D Bespoke Lipomed” weight loss treatment is offered by the Dr. Leah Clinic. Leah Totton won The Apprentice in 2013, and set up the Dr. Leah cosmetic clinic, co-owned by Sir Alan Sugar, in 2014. There are several different 3D liposuction treatments available, and each one is described as a safe non-surgical weight loss procedure that involves the destruction of fat cells. The weight loss options on offer include Ultrasound Cavitation, Cryolipolysis (fat freezing), and 3D Shockwave Cellulite Removal. These fat and weight loss procedures are performed in about 45 minutes and are classed as non-invasive, so no anaesthetic is required. Although recovery is described as immediate, the patient can suffer from sensitivity, bruising and numbness for up to 10 days after treatment, which is not ideal for those who want to be able to go about their daily lives immediately after a non-surgical weight loss procedure. In 2016 the FDA approved a weight loss device called the “AspireAssist”, manufactured by Aspire Bariatrics. This is possibly one of the most controversial weight loss procedures, because it has been referred to as a bulimia machine; it mimics binge and purge behaviour. The device is fitted in a 15-minute outpatient procedure, and is classed as a non-surgical weight loss treatment because it is performed under “twilight anaesthetic”, also known as “conscious sedation” or “Monitored Anaesthesia Care”. During this “non-surgical” weight loss procedure, the surgeon uses an endoscope to insert a tube into the patient’s stomach. The tube is connected to an external port attached to the skin. Around 20-30 minutes after eating, the person has to find a toilet, connect the device to the port and turn on the valve, which starts the “aspiration” process. Ten minutes later around 30% of the contents of the stomach will have been sucked out, which is how the weight loss is achieved. Some of the unpleasant side effects listed by the FDA include occasional indigestion, nausea, vomiting, constipation and diarrhoea, bleeding, sores on the inside of the stomach, pneumonia, and, in isolated cases, even death. If you want a completely safe, non-invasive, non-surgical weight loss option that provides permanent results, then look no further than the Gastric Mind Band. There are many different variations of this treatment promoted on the internet, all of which are based around the gastric band procedure. Some of these non-surgical weight loss procedures include the Virtual Gastric Band, the Hypnotic Gastric Band, Hypnoband and the Hypnosis Gastric Band, to name just a few. They were all, without exception, launched after the industry sector leader GMB. 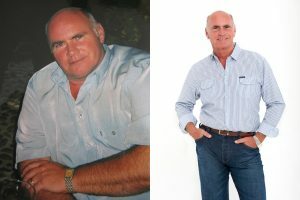 The GMB treatment, pioneered by Martin and Marion Shirran at their British-run clinic in Southern Spain, is certainly not the least expensive option – however, over a thousand people from around the world, including members of the general public and celebrities alike, acknowledge the treatment as the Gold Standard in non-invasive weight loss. On the Shirrans’ website you can read a number of verified client case studies and view for yourself their before and after photos. You can read stories like the one below from Claudia Connell of the Daily Mail and from a number of mainstream international magazines. If you still need convincing, then take a look at the Clinical Evidence page on this site, as written by Dr Sarah Clarke and presented at an International Psychology Conference. You can additionally email the clinic and request one of the team phone you to answer your questions, or why not ask to speak to a recent past client to give you the ultimate peace of mind? What’s the difference between non-surgical weight loss options? Or are they all just the same? One particular method, The Gastric Mind Band, was put together after years of meticulous research and development. It has now been successfully performed on hundreds of patients in the USA and Europe, and is often quoted as the ‘Gold Standard’ product among all of the non-surgical weight loss options that are now widely available. Featured at university presentations around the world and on international TV shows, Gastric Mind Band Therapy stands out from its competitors. It is certainly not the least expensive non-surgical weight loss option, but a little research will confirm its pedigree and explain the phenomenal interest it has gained from the world’s media. Check out the Gastric Mind Band website, read clients’ and journalists’ reviews, or contact the clinic and ask for a free telephone consultation. They have nothing to hide, and will always do their best to set your mind at ease. The psychological techniques used in non-surgical gastric band methods, such as the Gastric Mind Band, include Cognitive Behaviour Therapy (CBT) and their very own Tactile CBT, in the form of Pause Button Therapy. Non-surgical weight loss procedures are a safe, natural, totally risk-free and non-invasive effective alternative to weight loss surgery. Read the Clinical Evidence supporting the GMB treatment here.